Mom, the Intern: A devilish delight. One of my favorite blogs is Our Best Bites. It's a foodie blog, started by two young moms who love to cook and try new recipes. Their recipes are fairly easy and use pretty basic ingredients -- totally up my alley. Plus, they're notoriously delicious! Just look at how many followers they have if you don't believe me. 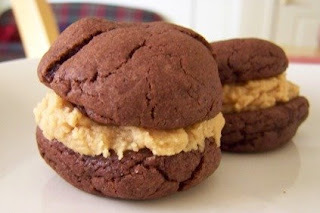 These scrumptious bad boys, which I like to call "Devilish PB Cookie Sandwiches". Preheat oven to 350 degrees F. Combine cake mix, eggs, and oil. Add water if needed. A doughy mixture should form. Roll dough into 1 inch balls and arrange on cookie sheet, 1 - 2 inches apart. Flatten slightly. Bake for 6-7 minutes. Careful not to overdo it; you want these to be soft and chewy! Yields 24-30 cookies. Using an electric mixer, whip the peanut butter and butter together until smooth. Add powdered sugar and vanilla. Then add milk, one T at a time. You may not need it all. You want the filling to be on the thick side; it should just have enough milk in it to make it easily spreadable. If you add too much milk (like a normal frosting consistency) it might squish out of the cookies when you take a bite. Frost flat side of cookie and sandwich with another. Sink your teeth in and relish every sumptuous moment. And there you have it. The most eeeevil recipe on the planet. Enjoy!